At the start of 2016, we reported on how the Pennsylvania Environmental Hearing Board (“EHB”) upheld the Pennsylvania Department of Environmental Protection’s (“DEP’s”) decision to treat a natural gas well pad and nearby compressor station as a single emissions source for air permitting purposes by expanding the concept of “common control” to include a common corporate parent that possessed the power to influence or direct the two wholly owned subsidiaries at issue. Not surprisingly, the owners of the compressor station, the well pad, and related corporate entities appealed that decision to the Pennsylvania Commonwealth Court, and last month the Court rejected the EHB’s “common control” analysis in favor of a rule that draws upon corporate liability principles that had been adopted by the U.S. Supreme Court to resolve cleanup liability questions under the Comprehensive Environmental Response, Compensation and Liability Act (“CERCLA”). While this decision (National Fuel Gas Midstream Corp. et al. v. Pennsylvania Department of Environmental Protection, No. 116 C.D. 2016) is the latest in a long line of single source aggregation decisions since the recent increase in unconventional oil and gas operations across the country, single source aggregation questions are not unique to that industry, and the general principles announced by the Commonwealth Court in June could impact air permitting decisions and approaches over a wide range of industries. As a reminder, under federal and state regulations, two activities qualify as a single emission source if the pollutant-emitting activities: (1) belong to the same industrial grouping; (2) are under common control; and (3) are located on contiguous or adjacent properties. In this instance, the appeals and an amicus brief filed by the Marcellus Shale Coalition focused primarily on the EHB’s finding that the well pad and the compressor station were under common control because they shared a corporate parent that had the power to direct or influence both of the subsidiaries through approval over their operating and capital budgets. The Commonwealth Court agreed with the petitioners and amicus, and rejected the EHB’s conclusion that common control among two corporations exists if the corporations share a corporate parent that has the power to direct or influence the operations of each subsidiary. The Court also rejected the DEP’s original reliance on common ownership alone. Instead, the Court turned to the U.S. Supreme Court’s decision in United States v. Bestfoods, 524 U.S. 51 (1998), which concerned when a corporate parent could be held liable under CERCLA for cleanup costs imposed on a wholly owned subsidiary. In the Bestfoods case, the U.S. Supreme Court held that CERCLA could impose either derivative liability on a corporate parent if facts existed that supported “piercing the corporate veil” between the subsidiary and the corporate parent, or direct liability if the corporate parent actually operated the facility. Against that backdrop, the Commonwealth Court first noted that similar to how CERCLA imposes liability for releases of hazardous substances, an air permit imposes liability for failure to comply with the permit’s terms. Moreover, in an instance where two sources are aggregated under a single permit, an aspect of this potential liability is indirect because the aggregated permit necessarily imposes compliance liability on the permittee for operations at the separate, aggregated source. As stated in Bestfoods, however, imposing indirect liability upon one corporation for another corporation’s operations necessarily requires piercing the corporate veil between the two corporations. Thus, in this case, to aggregate the well pad and compressor operations for air permitting purposes, DEP would be required either to demonstrate that the owner of the compressor station had direct involvement in the operations of the well pad, or that facts existed to support piercing the corporate veil between the owners of the compressor station, well pad, and/or their shared corporate parent. In coming to this decision, the Commonwealth Court seemed to be particularly influenced by the fact that the well pad operations were themselves exempt from air permitting. Thus, the compliance obligations imposed on the owner of the compressor station by the air permit would be subject to the conduct of operations at the well pad, which were owned by a separate corporation that was not otherwise required to secure and comply with an air permit. In addition to announcing the foregoing approach on the “common control” prong of the aggregation analysis, the Commonwealth Court addressed the question as to whether DEP would be required to establish that the well pad and compressor station met the “common sense notion of a plant” separately from the three prongs of the aggregation test mentioned previously. The Commonwealth Court ultimately declined to add this concept as an additional requirement to the aggregation analysis, instead holding that two operations necessarily meet the common sense notion of a plant if the three prongs of common control, single industry, and contiguousness or adjacency are satisfied. While the Commonwealth Court was explicit in its approach to “common control” questions, the Court refused to resolve the matter based on the existing record and instead remanded the matter back to the EHB. Accordingly, this decision may not be the last word when it comes to evaluating issues of common control for purposes of single source air permitting. 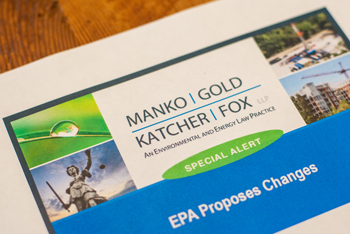 Furthermore, the aggregation concepts announced by this decision and the follow-up proceedings are not necessarily limited to the oil and gas industry, and thus the ultimate outcome of these proceedings will likely affect single source permitting approaches for all industries in Pennsylvania. For more information, contact Todd Kantorczyk at tkantorczyk@mankogold.com or 484-430-2359.